Let us consider the following problem to understand Segment Trees. 2 Change value of a specified element of the array to a new value x. We need to do arr[i] = x where 0 <= i <= n-1. A simple solution is to run a loop from l to r and calculate sum of elements in given range. To update a value, simply do arr[i] = x. The first operation takes O(n) time and second operation takes O(1) time. Another solution is to create another array and store sum from start to i at the ith index in this array. Sum of a given range can now be calculated in O(1) time, but update operation takes O(n) time now. This works well if the number of query operations are large and very few updates. What if the number of query and updates are equal? Can we perform both the operations in O(log n) time once given the array? We can use a Segment Tree to do both operations in O(Logn) time. 1. Leaf Nodes are the elements of the input array. 2. Each internal node represents some merging of the leaf nodes. The merging may be different for different problems. For this problem, merging is sum of leaves under a node. 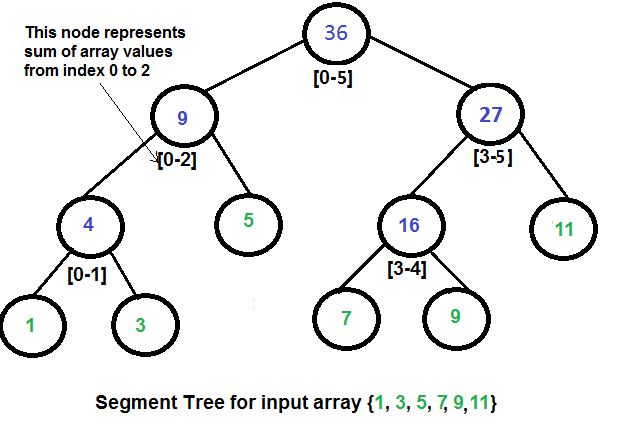 An array representation of tree is used to represent Segment Trees. For each node at index i, the left child is at index 2*i+1, right child at 2*i+2 and the parent is at . How does above segment tree look in memory? Like Heap, segment tree is also represented as array. The difference here is, it is not a complete binary tree. It is rather a full binary tree (every node has 0 or 2 children) and all levels are filled except possibly the last level. Unlike Heap, the last level may have gaps between nodes. Below are values in segment tree array for the above diagram. The dummy values are never accessed and have no use. This is some wastage of space due to simple array representation. We may optimize this wastage using some clever implementations, but code for sum and update becomes more complex. We start with a segment arr[0 . . . n-1]. and every time we divide the current segment into two halves(if it has not yet become a segment of length 1), and then call the same procedure on both halves, and for each such segment, we store the sum in the corresponding node. All levels of the constructed segment tree will be completely filled except the last level. Also, the tree will be a Full Binary Tree because we always divide segments in two halves at every level. Since the constructed tree is always a full binary tree with n leaves, there will be n-1 internal nodes. So total number of nodes will be 2*n – 1. Height of the segment tree will be . Since the tree is represented using array and relation between parent and child indexes must be maintained, size of memory allocated for segment tree will be . Once the tree is constructed, how to get the sum using the constructed segment tree. Following is the algorithm to get the sum of elements. Like tree construction and query operations, the update can also be done recursively. We are given an index which needs to be updated. Let diff be the value to be added. We start from root of the segment tree and add diff to all nodes which have given index in their range. If a node doesn’t have given index in its range, we don’t make any changes to that node. Following is the implementation of segment tree. The program implements construction of segment tree for any given array. It also implements query and update operations. // A utility function to get the middle index from corner indexes. of the array. The following are parameters for this function. // The function to update a value in input array and segment tree. // A recursive function that constructs Segment Tree for array[ss..se]. cout<<"Updated sum of values in given range = "
// middle index from corner indexes. are parameters for this function. // in input array and segment tree. // Segment Tree for array[ss..se]. Time Complexity for tree construction is O(n). There are total 2n-1 nodes, and value of every node is calculated only once in tree construction. Time complexity to query is O(Logn). To query a sum, we process at most four nodes at every level and number of levels is O(Logn). The time complexity of update is also O(Logn). To update a leaf value, we process one node at every level and number of levels is O(Logn).